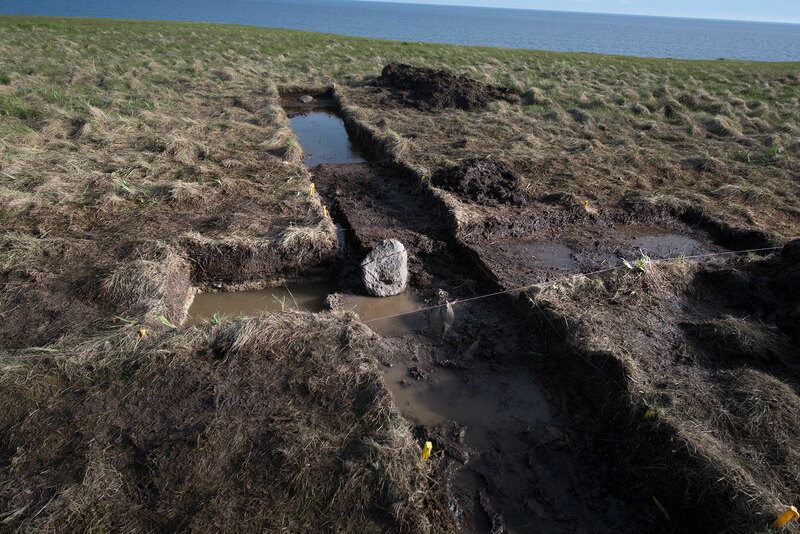 A test excavation in the peninsula of Point Rosee in southwestern Newfoundland, Canada, has unearthed evidence of a Viking settlement. If the site is confirmed as Norse, it will be the second of its kind and history books will have to be rewritten because Point Rosee is significantly more to the west than the Vikings were thought to have traveled. Two Icelandic Sagas — the Saga of Eric the Red and the Saga of the Greenlanders — recount how Leif Eriksson discovered a land to the west called Vinland and how Thorfinn Karlsefni followed in his footsteps and attempted to found a settlement in Vinland. Very little archaeological evidence has been found to support the oral and literary tradition (the sagas were written down 250 years after the events they describe). 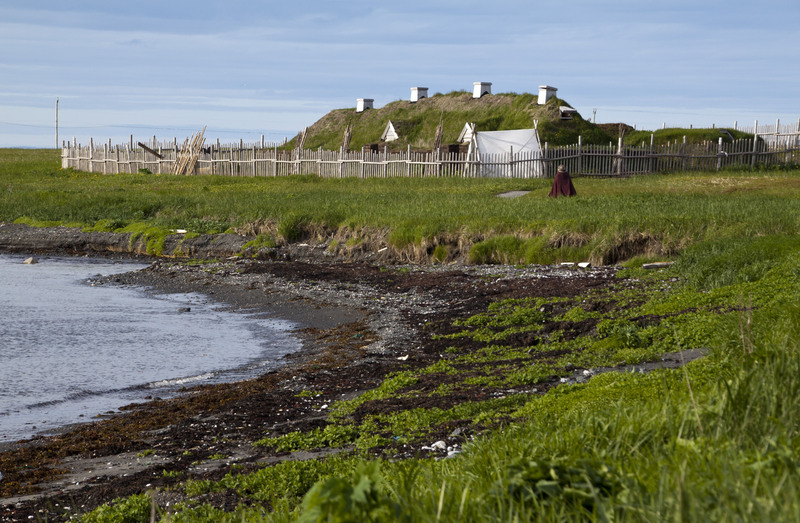 In 1960, the first and so far only verified North American Viking site was discovered in L’Anse aux Meadows, a coastal settlement on the northernmost tip of Newfoundland, 300 miles northeast of Point Rosee. Since then, a great many searches have turned up very meager evidence, none of it confirmed, of Norse settlement, but people keep looking. The Point Rosee site was pinpointed on satellite images by space archaeologist Sarah Parcak who has made the news recently because a) space archaeologist is probably the greatest job description of all time, and b) she won the $1 million TED prize last year for her work in locating ancient Egyptian sites and tracking looter activity from the skies. Parcak was enlisted by the PBS science program NOVA to scour satellite images from Baffin Island to Massachusetts in the search for Viking settlements in North America. She found hundreds of possibilities and one stand-out that appeared to have rectilinear structures hidden under vegetation. Parcak and Canadian experts explored the site this summer. A magnetometer survey found a spot with high iron readings that according to the satellite images was surrounded by those buried straight-line features. The team dug exploratory trenches on the spot. They unearthed turf walls and a shallow pit. In front of the pit was a fire-cracked boulder. 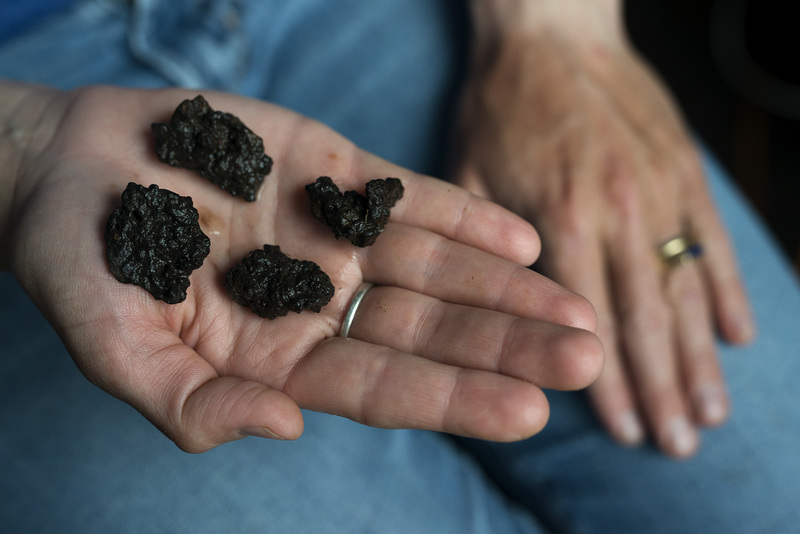 There also found ash residue, 28 pounds of slag and lumps of roasted iron ore. 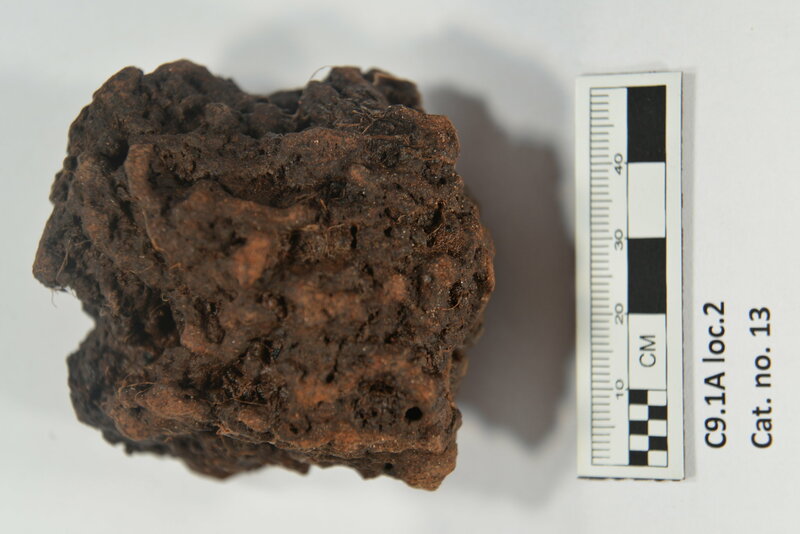 The evidence points to this being a hearth used to process bog iron, ore carried by rivers to wetlands where it forms metal deposits. The Vikings weren’t miners, but they needed a great deal of iron to maintain their ships. A replica longship in the Viking Ship Museum in Roskilde, Denmark, has 7,000 iron nails keeping it together. That converts to 30 tons of raw ore just to supply enough nails for a single ship. That’s a lot of bog iron. Only one other bog iron smithy has ever been found in North America: L’Anse Aux Meadows. Native Newfoundlanders did not practice this kind of metallurgy, nor is there any other evidence (flint, pottery) of indigenous or later European settlers present at the site. The excavation team will return to Point Rosee this summer to dig for more history-making treasure. Vikings Unearthed, the NOVA episode that documented their work last year, premiers on Wednesday, April 6th, on PBS in the United States. UK viewers get it two days earlier, Monday, April 4th, on BBC One. It will also be available streaming on PBS’ website starting Monday at 3:30 PM. This entry was posted on Saturday, April 2nd, 2016 at 5:08 AM	and is filed under Medieval, Modern(ish). You can follow any responses to this entry through the RSS 2.0 feed. You can skip to the end and leave a response. Pinging is currently not allowed. I’m really looking forward to watching this on Monday. My father used to claim that we were partly of Viking descent, but I don’t suppose that we are much more so than other modern Britons. Though we did have local place names of obviously Norse and Danish origin. But also of obviously Brythonic, Gaelic, Anglo-Saxon, Norman, Roman, and Flemish origin. It takes all sorts. 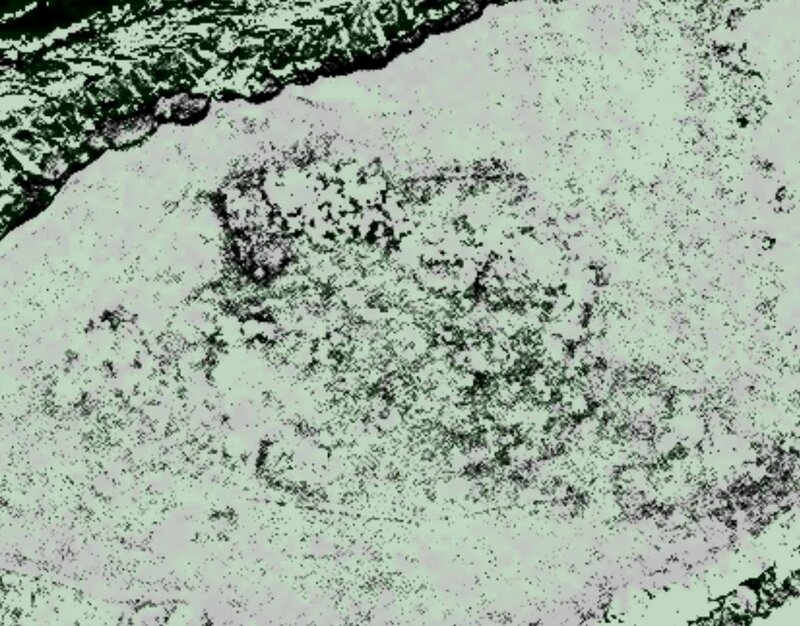 On reflection: if space archaeology can find the needle in the haystack that is a Viking site on the eastern North American coast, what new might it find in a small archipelago on the other side of the Atlantic? I hope it turns out to be true because the Spanish, Portuguese and the Vatican were so pompous about dividing up the world and exploring new places between them. And I love the idea of having to write new history books because recent discoveries make our old certainties out of date. Point Rosee in Newfoundland might turn out to be very significant! The iron wouldn’t have been needed for just ships. It would have been needed for pretty much anything that an iron age society needs. There was hardly any ore in Greenland nor suitable vegetation for heating kilns (or building ships for that matter). So they really had no choice but to either get iron and timber from North America or trade through Iceland. This is a reason for having a TV. Worth staying up past my bedtime for. Favorite moment: When the coprolite scholar informed his meal companion they were sitting atop a great depth of petrified medieval urban poo, intestinal worm egg-ridden to boot. “scatologist”: I hooted. A mild anti-climax at the end – she may well have found a Viking site, but more research grants are required.